Why the hell not?! Red captures attention. It is claimed that red can raise your blood pressure and quicken your heartbeat – it certainly does in education. Red is the colour of love, violence, danger, anger, fire, energy, luck and adventure. It’s also a ‘teacher colour’ that some educators despise. But it’s great to see that many of my colleagues aren’t protecting the snowflake generation from red ink. They use it because they have the freedom to. Some teachers aren’t so lucky and have to follow a ridiculous school policy that equates red with ‘shouting’ which could upset pupils and damage their self-esteem. These policies say that it’s okay to use certain colours – neutral ones – but not red because it is confrontational’ and ‘threatening’ and the equivalent of speaking in Caps Lock. Writing in blue or green is seen friendlier and better for creating a rapport with students. Writing in red is confrontational’ and ‘threatening’ and the equivalent of speaking in Caps Lock. Okay, so what we have here is a colour prejudice which sends out a message to children that colour matters. Of course colour matters but when we exclude certain colours from our marking then we are equating them with negative traits and behaviours. Are children really emotionally vulnerable to a particular colour? Will red hurt their feelings? The red grading pen can upset students and weaken teacher-student relations and perhaps learning. But this is quite frankly just ridiculous and misguided. Some students perceive comments written in red more negatively because the culture of a school has imbued red with authority and red in our lives has strong associations with DANGER and STOP! They say that red is an angry colour – really? In some cultures red is a ‘lucky’ colour. To non-Chinese, the colour red is all fire and warning but in Chinese culture, red is an extremely auspicious colour. Red packets are given to children during Chinese New Year containing money so red has a very different meaning! Chinese red eggs are served during an important birthday and these symbolise joy and renewed life. In Russia, the word for “red” means beautiful, Japanese children draw the sun as a big red circle and in East Asian stock markets, red is used to denote a rise in stock prices. Pen colour does affect pupil-teacher relations but not in the way we might think. If we align ourselves with particular colours and ban others then we can be creating divisions in the minds of children that don’t have to be an issue. Some argue that red comments can actually be read more easily than some neutral colours which are far from easy to read than aqua or green and so end up watering down the message. Lots of teachers I know mark in ‘green’ but this can be a real problem for some pupils who see colours differently to their peers. Is your school colour blind friendly? Different pupils perceive colours in different ways. You might be using a colour that children simply don’t see as others do because they have a colour vision deficiency – red and green colour deficiency is very common. In this case then avoid marking in red and green if you have a child with colour blindness. It is estimated that there are 450,000 children in the UK who are colour-blind so the chances are you will have someone in your class who does have a type of colour blindness (and there are many). Banning colours isn’t necessary across a whole-school but being colour-blind friendly is a must – this is about knowing your pupils and their special needs. Blanket bans can do more harm than good, especially if your staff are told to all mark in ‘green’. Red is a culturally symbolic teacher colour that has been demonised and to ban it is just prejudicial nonsense. 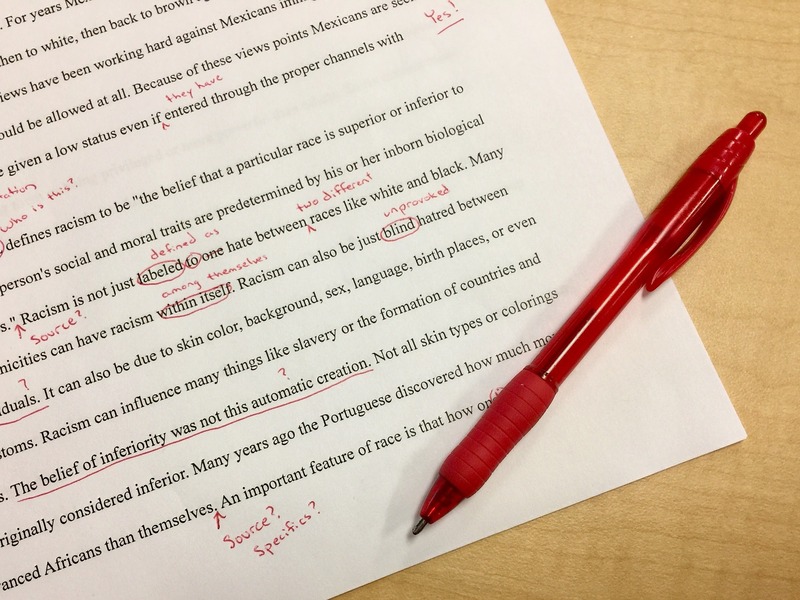 Use a red pen if you want, use any colour – let’s value diversity and avoid racist marking and assessment guidance that tells us what colour we should and shouldn’t be writing in. But be in tune with your children and use colours that don’t exclude them. Children are no longer screened for colour blindness on school entry and our studies show that approximately 80% of colour blind students are undiagnosed when they enter secondary school (Year 7). Primary school teachers regularly use the ‘traffic light’ system for marking, to help them understand how difficult their pupils find different worksheets or to indicate expectations of good and bad behaviour but for a traffic light system to be effective it relies upon all the children being able to tell the difference between red, green and orange. A colour blind student won’t be able to complete worksheets, give you feedback or follow your marking as he can’t always see the difference between these colours. The colours we use in school are incredibly important and we are failing some of our children if we assume that everyone sees the world in the same way. We have to put disability at the heart of everything we do and make sure we are pupil-led for the right reasons.